WISHLIST: It's a Nice Day for a...Pink Wedding! This is my entry for Fearless Bride's spring bridesmaid contest. The challenge is to come up with a bridesmaid's outfit suitable for Spring for £200 or less, with the chance to win ASOS vouchers. I've always known I want to wear a 1950s style dress when if I get married with lots of tulle and petticoats. So naturally I'd love to dress my bridesmaids in something similar, so I've gone for a very girly, but still quite rockabilly look and - because it's me - lashings and lashings of pink. I am absolutely besotted with DollyDagger dresses - their regular range goes up to a size 16, but they also have a plus size range. This was my favourite, and just happened to be in the sale - hopefully it will come back into stock soon! So - going by the prices by the time I wrote this entry last week - that takes this outfit to a grand total of £154.89! It's been funny old weather lately hasn't it? But thankfully, it appears Spring arrived in Newcastle today. 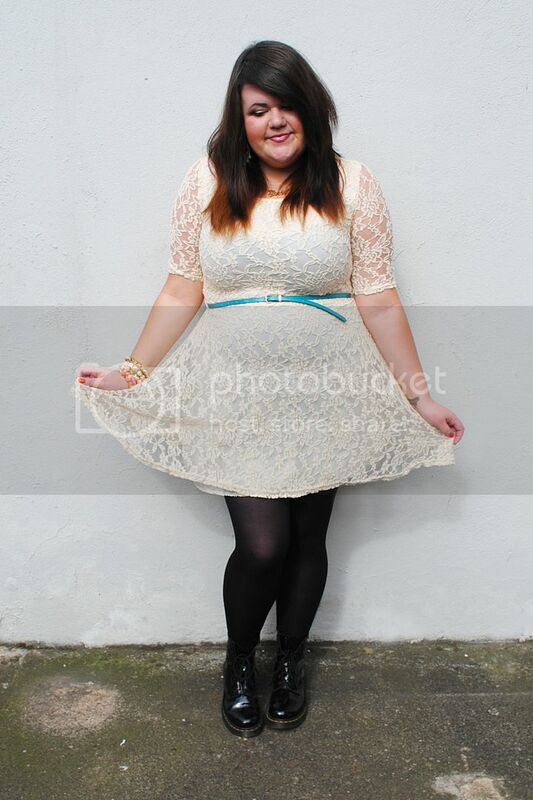 I picked up this dress in the New Look sale for only £10 which was awesome - I've always wanted a white lace dress, but all the ones I'd tried previously make me look a little frumpy. 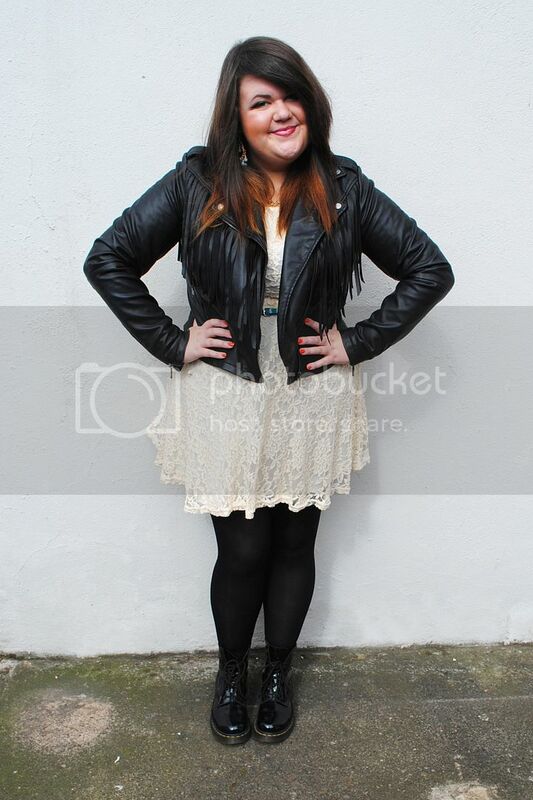 It's only a size 12, which obvious I am nowhere near - but it just goes to show how important it is to try something on. Also if you follow me on Twitter, you'll know I've been whinging about feeling under the weather since Saturday so I've hardly left my bed. However I was feeling better today, so hooray! 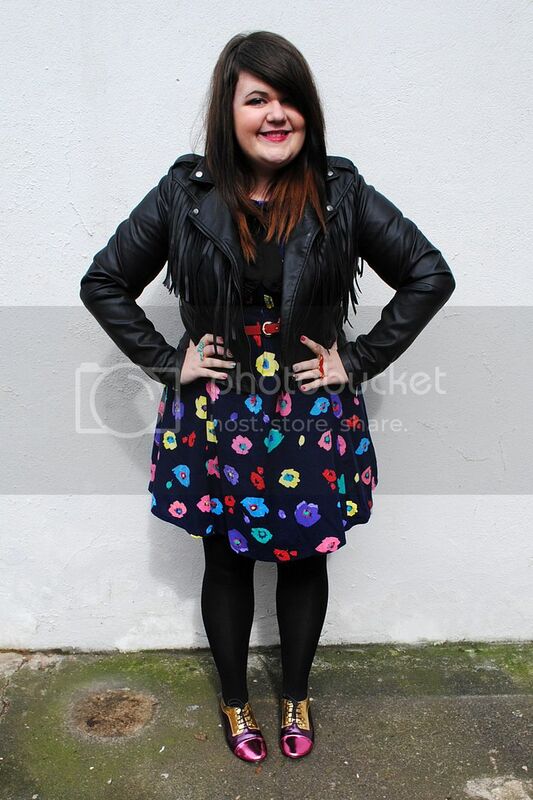 DRESS: Mela Loves London via New Look. Unfortunately there's no close up of my makeup today as it was just too sunny and I'm squinting in all the photos. Sorry! 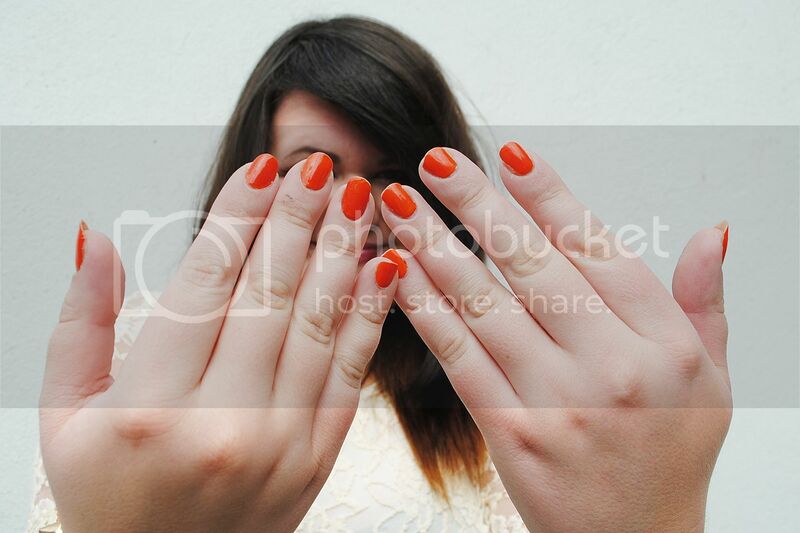 I'm a bit obsessed with neon nails lately - this is Tangerine by Barry M, but there are a good few layers on which is why it looks a little reddish. 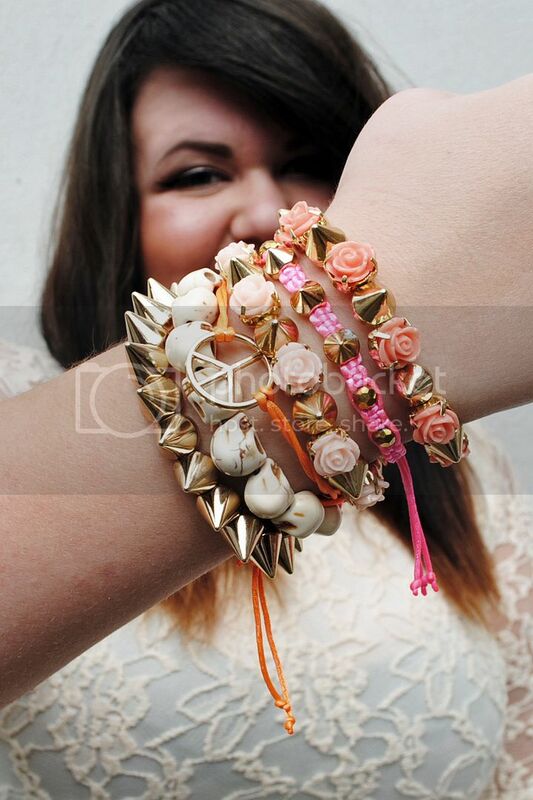 Excuse the Rosie the Riveter-esque pose - my bracelets are from New Look and Primark. So since I'm still feeling a little under the weather, I just took it easy today with Italian Catholic Mother - we did a little pre-birthday shopping (I'm 24 next month, wahh! I was just a wee bairn when I started this blog) then went to our favourite Italian (Puccini's on Pudding Chare) for pizza and tiramisu. Nothing like comfort food - the best medicine there is! I already posted this on Instagram, but we're in the final stages of our renovation and my parents uncovered this awesome vintage camera in a cupboard with a flash gun and is now mine! It's a Halina 3000, and the internet tells me it's from about 1974. I've already got some film and can't wait to play around with it. I did take a film photography class at university, but I was absolutely useless - hopefully I'll be better this time around and will be able to share some of masterpieces (yeah, right) here. Finally, my parents also found an Avon beauty book from 1976 which is also now in my possession. PRO TIPS include: "Closely cropped hair on a big person can make the head look too small for the body" and "Too much hair can overpower a small person." Me and my sister have a bit of an obsession with TK Maxx and one of my favourite sections is the beauty department. Though they stock recognisable brands such as Stila, Kiehl's, Orly and Elizabeth Arden, there are lots of international brands to browse too. I recognised a few names such as Bioderma, Caudalie, KMS and Ahava from when I was subscribed to Glossybox. But as my sister went and browsed for picture frames for her new flat, I spent well over an hour reading labels and deciding. I was sure I was about to be moved on at one point for loitering. 1. 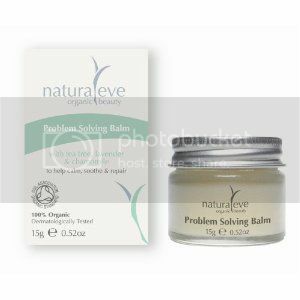 Natural Eve Problem Solving Balm (15g), £3.99. At nearly-twenty-four-years-old I can't believe I still have problem skin. At the moment, I'm having a lot of break outs around my chin area, and usually they are just too sore to pop (TMI, sorry). It can also be used for itchy bites and stings, dry or irritated skin and minor grazes and bruises so it's nice and universal. It comes in a little pot, which has the same texture as a lip balm and has quite a strong, but not at all unpleasant smell - you can definitely get a whiff of the tea tree in there. I've been using this for the past week and my skin has definitely improved, and is not as sore anymore. 2. Mogador Restorative Shampoo (250ml), £3.99. A haircut and several treatments later, my hair is still suffering from Post Australian Summer Stress Disorder. I'm using lots of conditioner, but worrying that the 'drugstore brand' shampoos are actually stripping my hair. I've experimented with using Lush shampoo bars but they can sometimes make my hair a little flat - especially as I have such fine hair. It has a very musky, incense-like smell and reminds me of a the Paco Rabanne One Million fragrance Daniel wears. Definitely different to the fruity shampoos I'm used to! It's ingredients include Moroccan argan oil, organic shea butter and organic jojoba oil, and is paraben-free - so hopefully I will see a difference soon with a more gentle cleanser. 3. Argania Spinosa Organic Argan Oil Special Treatment Masque (500ml), £9.99. 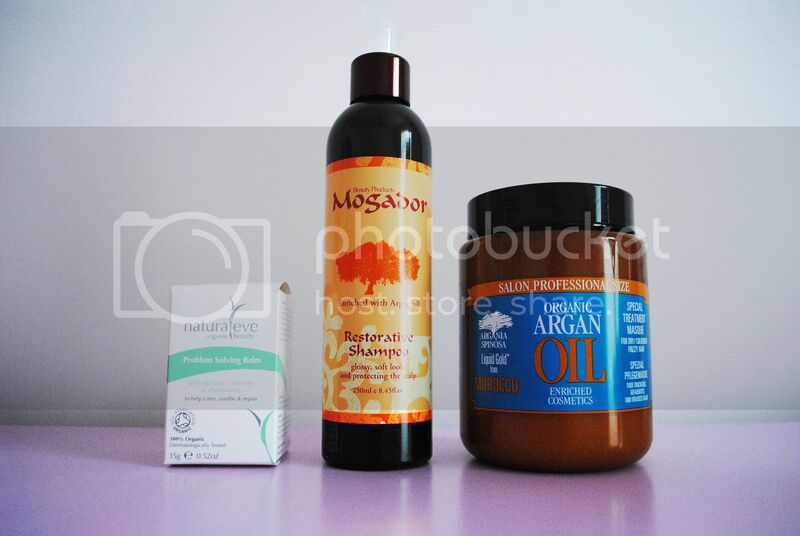 The shelves at TK Maxx were full of the Argania Spinosa products which caught my eye as their packaging is quite similar to MoroccanOil - one of my daily hair essentials. The range included shampoos, conditioners and the concentrated oil - but I decided to go for the mask treatment as it is especially for dry hair and as I got the salon size for £9.99 I considered it the best value for money. As the name suggests it is loaded with Argan Oil, which is rich in Vitamin E and has high repair qualities. It smells just like the MoroccanOil products and looks and feels very thick, creamy and luxurious. I've worn this twice the last week (left on overnight*) as my hair really does need some TLC, and I can already see a difference in the ends. So I 100% recommend this! Would you believe during my fifth year writing this blog I have finally started blogging about beauty? I'm no expert by any means, but I'd like to start a monthly favourites feature - which I know is by no means original, but I love reading them. And it may not always be beauty - I might sneak some clothing items in there, or even a book! * I was also wearing my green Mask of Magnaminty from Lush and a Crest Whitestrip so scared the life out of Papi B when I came out of the bathroom. Spring has definitely sprung. And by sprung I mean that Twitter exploded last week because we got one day of sunshine. 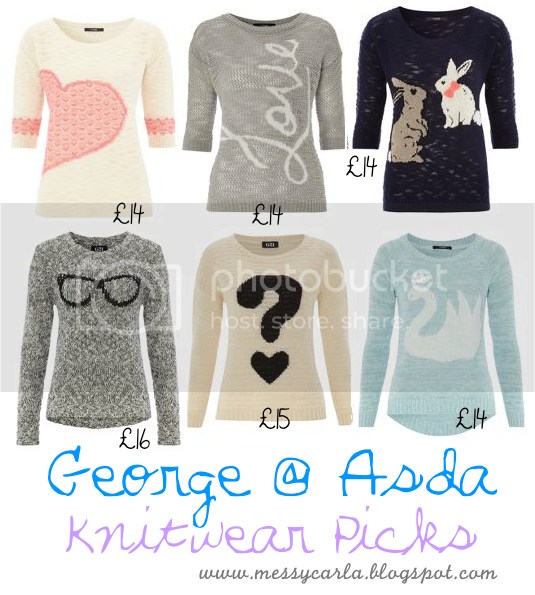 However spring also means it's still chilly enough to wear pretty knitwear, and there is a really great selection at Asda right now with everything under £20. As much as I adore dresses, and definitely feel more 'myself' and confident in a dress, I'm trying to get into the habit of wearing separates again. I tend to size up for jumpers, so this is a size 18. It's a lovely lightweight material, which is my favourite for jumpers, but I could have easily sized down for this as it's very generous. 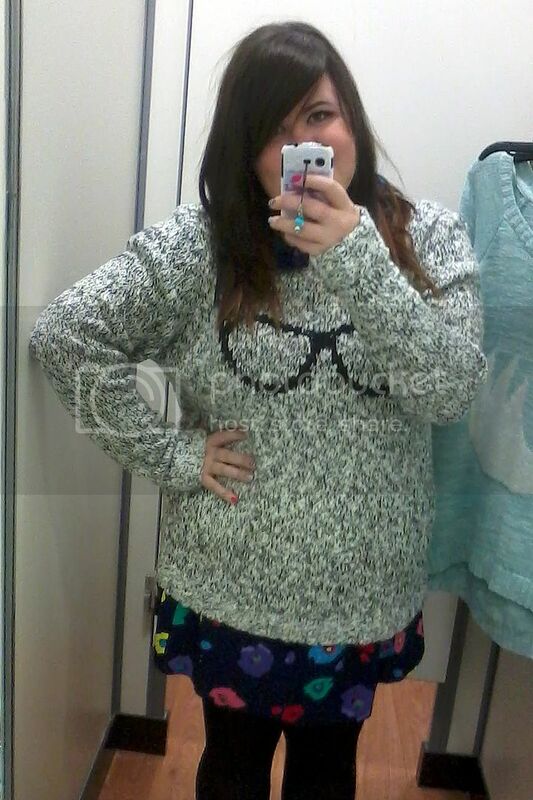 Looking again now, I'm definitely going back to buy this. The only reason I didn't as it's too similar in colour to my Topshop jumper I sadly don't wear enough (which is ridiculous, because it's gorgeous!). Again this is an 18, and again, very generous sizing. This is a much heavier material to the swan jumper, and the third one below. The grey pattern is so cute, and reminds me of something you'd see in Topshop for a fraction of the price. However I found it a little too long for me, and I definitely prefer a more lightweight material. 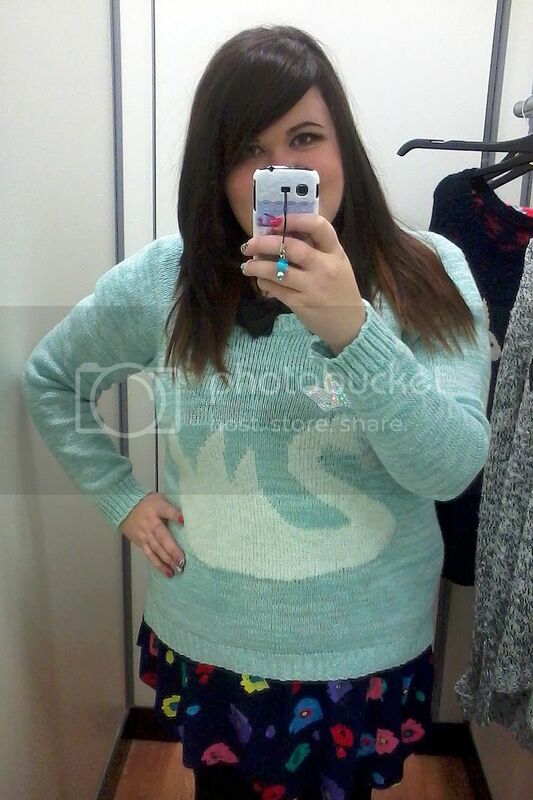 This is a very similar shape to the swan jumper, except it has 3/4 length sleeves (my favourite!) and is more of an oversized fit. There were only size 12s on the rack, but looked very generous - and lo and behold it fits perfectly! So if you're like me and prefer a more fitted look, definitely go for several sizes down. I ended up buying this as it's just so cute - however I will take very good care of it, as I think it will stretch out a lot after a few washes. Here are some more of my favourite from their knitwear this season. What do you guys think? What's your favourite in the range? 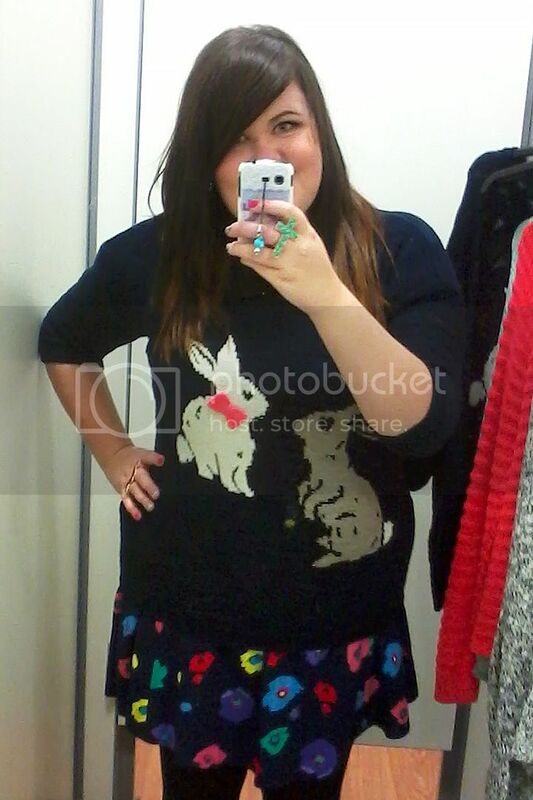 Would you have gone for the bunnies too, or something else? I finally succeeded in my quest to find the perfect leather (well, pleather) jacket. It's such a wardrobe staple I feel I've been missing, but never quite found one that fits me properly (most seemed to ride up at the waist while squishing my breasticles) and I've been wearing this constantly since I bought it a few weeks ago. 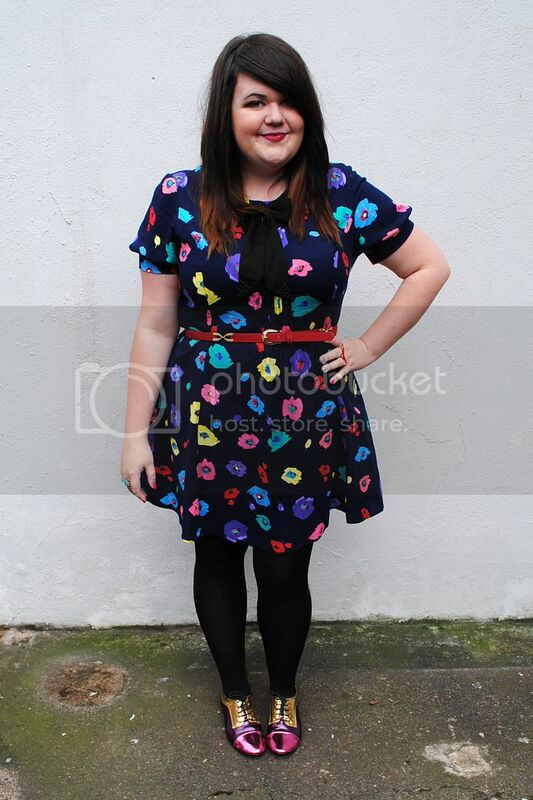 I had a bit of a rummage through the sales, and found this amazing Henry Holland dress half price for £25. NAILS: Fuchsia Power by Sally Hansen, Silver by Barry M, a brand less white polish and Model's Own Nail pen. The design is shamelessly stolen from the awesome PinkURock. 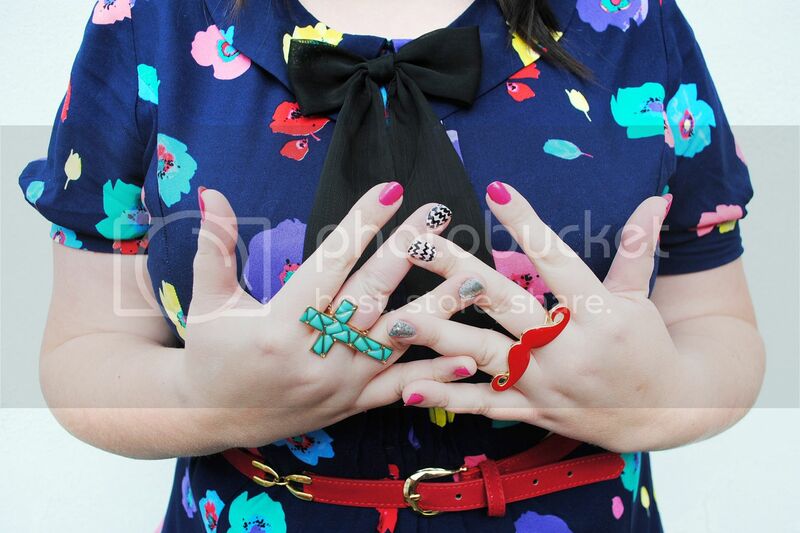 I was very kindly given the turquoise cross ring from YourFashionJewellery.com, and absolutely love it. I have previously reviewed one of their skull shamballa bracelets here. They have lots of statement jewellery peices which are great quality for the price you pay so definitely go and check them out! I hope you don't mind that I don't have a makeup look/face of the day picture to go with this post, but my skin has been very problematic lately and I'm rather self conscious of it. I am wearing a NYC lip stain here in shade 494/Smooch Proof. The packaging suggests they can last for up to sixteen hours, but they start to fade for me after an hour or so. They're very affordable though at £3.99 (and there are some on Fragrance Direct right now for only 99p) so great to try before buying the Revlon or Clinique ones with a higher price tag. After a shaky few weeks lately, I can feel my blogging mojo coming back. I'm planning lots of posts, including an updated room tour since I redecorated, and am thinking of starting a monthly favourites series as I always enjoy watching those on YouTube (though mine will mostly likely still be in the blogging format). If you have any ideas on what you would like to see in future posts, remember I am always open to your suggestions - so feel free to write me a comment or send me a tweet or email! I always love hearing from you. I'm very overwhelmed with the response to my ASOS giveaway - you have over a week to enter if you haven't done so yet! Finally, I'd like to wish a happy 22nd birthday to one of my best friends, Daniel. I owe you a Nandos date and some drinks when you're finished smelly dissertation work. Many happy returns, baby cakes. 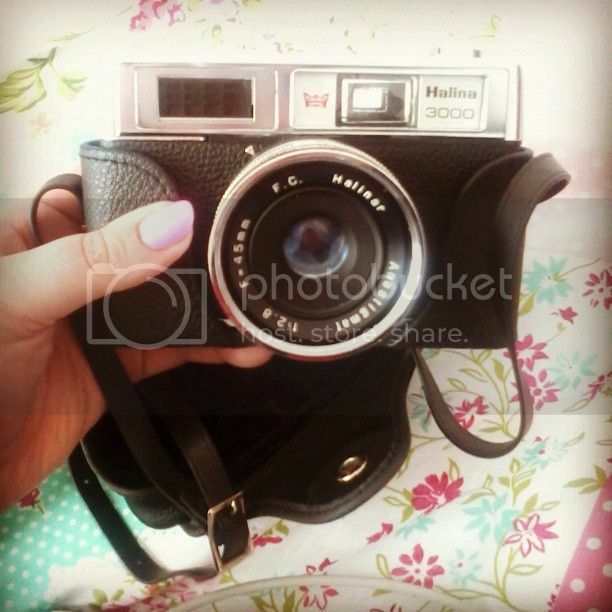 Thank you to everyone who entered and congratulations to the winner - Lucy! I'm very excited to bring you another giveaway! The fantastic people at AppliancesOnline have offered me £80 worth of ASOS vouchers to giveaway to you guys. Unfortunately, as the vouchers are in GBP this giveaway is only open to UK residents, sorry! DISCLAIMER: Sponsored Post in collaboration with AO.com.